Lips Duffel Bag. Comes with shoulder strap for easy carrying. 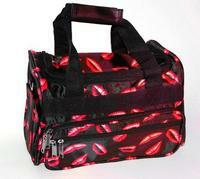 Has outside zipper compartment and side pouches. Makes a great conversation starter "warm chatter" bag. Available in 3 sizes. Small is approximately 12" long by 8" high by 8" wide. Medium is proportionately larger, approximately 14" long. Large is proportionatel larger, approximately 16 inches long.